Jack Mercer, who was also Popeye, did all the voices. Yes..Paktype.."Poindexter"is the name of"The Professor's"
Yes.."The Professor's nephew was named "Poindexter". Ch.7 in NYC weekday mornings back in the late 1950's. WNEW TV Ch.5 in NYC. I enjoyed those cartoons. Wasn't the name of the Professor's brainy nephew "Poindexter"? Every time I hear about Buster Poindexter, I think of this toon. 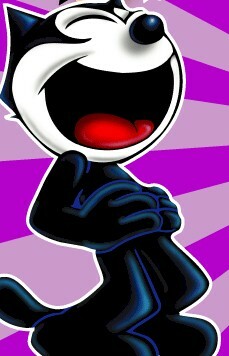 Used to rush home from school to watch Felix the Cat every day in the late 50's. Favorite cartoon. My son-in-law is such a fan, he and my daughter named their son Felix.